Worn with the Formal Dress and Casual Dress kilt. 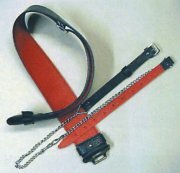 This belt is all leather with red lining. $115.00 with chrome buckle (#1). $160.00 with cast peweter buckle (#2 or #3).